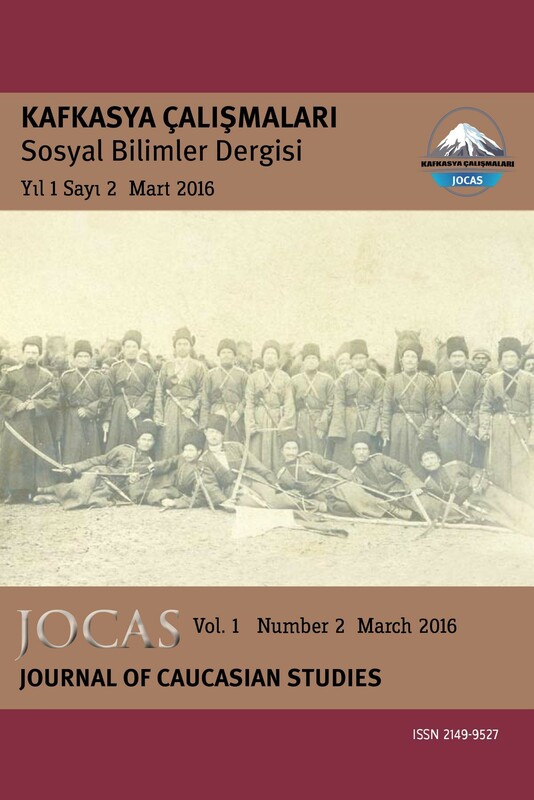 Journal of Caucasian Studies (JOCAS) is a peer-reviewed biannual international academic journal published in May and November. Manuscripts in English, Turkish and Russian on history, geography, ethnology, anthropology, linguistics, and politics of the Caucasus region and its peoples are considered for publication. JOCAS is using plagiarism software in order to detect and prevent plagiarism. JOCAS is being indexed in Crossref, Open Academic Journals Index (OAJI), International Institute of Organized Research (I2OR), Arastirmax, Türk Eğitim İndeksi, Eurasian Scientific Journal Index, ResearchBib, Akademik Araştırmalar İndeksi (Acarindex), Scientific Indexing Services, Academia Social Science Index (ASOS), SciLit, Directory of Research JournalsIndexing (DRJI) and Sobiad. Kitap İncelemesi "Çerkes Soykırımı - Walter Richmond"